Following the earthquakes in Haiti and Chile, the world mobilized to provide needed resources to support relief and recovery efforts. The outpouring of support was inspiring and moving, and reminds us of the interconnected nature of our world today. Multinational companies also stepped up to provide support. Most corporations, in the immediate aftermath of a disaster, follow a set of steps to insure employees’ safety and the security of their sites. While the company’s security team or local office often lead these efforts, the teams responsible for corporate giving are less known and recognized, but important partners in insuring a swift and appropriate financial and in-kind response to disasters. Most multinational corporations have boots on the ground across the globe and are frequently well positioned to leverage their local knowledge and communication networks to move products quickly to reputable NGO and governmental partners through existing supply chains. We have contacts in local governments, NGOs, and at other companies, and, as a result, can communicate efficiently and effectively to assess the needs and coordinate the appropriate responses. It is our responsibility to help, especially when our local communities are affected. At Pfizer, when a natural disaster occurs, our response team works closely with the local markets to determine an appropriate response. We believe this is part of the company’s commitment to addressing global public health issues. We also engage and consult with organizations like the Partnership for Quality Medical Donations to ensure coordination and collaboration where appropriate. Here’s how it works. Our local offices provide the initial assessment following a disaster, which includes an analysis of which on-the-ground institutions are best equipped to deliver needed supplies. A plan of action—focusing on cash grants and critical supplies, as well as human capital—is then developed in collaboration with local and main office employees. Events such as the earthquakes in Haiti and Chile warrant a response that directly addresses the needs that local officials have expressed for help. In the cases of Haiti and Chile, for example, Pfizer Latin America colleagues spoke directly with embassy and ministry of health officials, respectively, in the days immediately following the earthquakes to determine the governments’ primary relief partners as well as which Pfizer products were needed. By working in collaboration, multinationals such as Pfizer can help to address the acute health impact and the significant loss of life and destruction. As a healthcare company, product donations are a way to provide much needed assistance. We attempt to source these donations locally and we comply with World Health Organization guidelines that seek to ensure that donated medicines are appropriate for both the recipient country and the patients. Colleagues at headquarters help to centralize communications internally so that employees across the globe understand their role in facilitating a quick response. Following the January 2010 earthquake in Haiti, donations came from Pfizer sites in at least five countries. In the case of large-scale disasters such as the 2004 Indian Ocean tsunami or Hurricane Katrina in 2005, and in Haiti recently, Pfizer worked with local partners to identify the medicines and other in-kind product donations that were most needed and could be delivered quickly. A total of nearly $5 million in cash, products, employee contributions, and employee contributions matches was donated to support Haiti relief efforts. Products requested by the government and NGOs that were donated included Diflucan, Zithromax, and Advil, among others. Based on locally identified needs, we also deploy expertise by sending our colleagues into countries to help rebuild after disaster strikes, through a program called the Global Health Fellows. We sent supply chain teams to Asia after the Tsunami to help rebuild the devastated distribution systems and are currently working with NGO partners to place fellows in Haiti. This is a model for how corporations should respond during times of crisis—local collaboration and quick delivery. 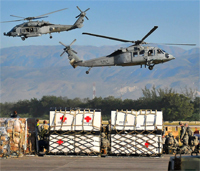 Centralization of disaster relief responses internally and externally allows a company to put its best resources forward quickly and efficiently. One step in the recovery process. Caroline Roan is Vice President of Corporate Responsibility at Pfizer Inc and President of Pfizer Foundation. Fracking in Colombia: For Real This Time? Colombia’s oil reserves are dwindling. President Duque sees fracking as a possible solution. China is the top commercial partner for Brazil, Chile, Peru, and Uruguay, and the U.S. trade dispute is further binding those ties.